Stitch this French inspired design in black and white. Each design is personalized for you! The colors can be changed and the fonts adjusted to the stitcher's or the bride-to-be's choice. Please be sure to include the names and date in the names and any other changes you would like made to your canvas. 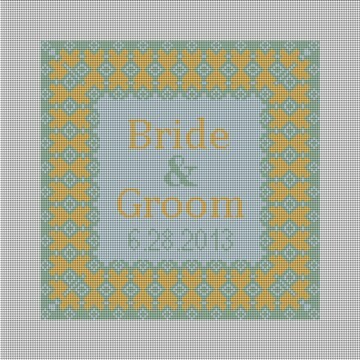 Please contact us if you are interested in having make a needlepoint ring bearer pillow for you.